Hi there, I found a vintage car rotting in a backyard out in the open and while trying to find who the owner is, first I need to know what that car actually is. So if you could recognize this model, please give me any hints! Thank you very much in advance! 1984 Pontiace Fiero Unrestored Survivor! 1984 Pontiac Fiero SE, 4 cylinder, auto, sunroof, factory air, all original 66137 MILES! This is an orginal paint other than the front bumper cover and right fender (both painted when it was 6 months old) survivor. Must see, all types of paperwork included, window sticker, service manual, invoice to purchase as a GM employee, etc.... My father bought it new. Ordered in October of 1983, delivered in January 1984. 30 years in the same family! It is a true preservation auto. It still has original belts and hoses. Interior is all original and beautiful. Headlights go up and down like they should! This car is all about preservation, not restoration. Take it to car shows, put it on display, whatever you want! The AC was converted to R134 in the late 90s, it has some type of restriction, so I do not use the air. It has had all of the campaigns done for the oil leaks, but it still leaks some oil. Just letting everyone know that it is a 30 year old GM car, so it is not without it's sins. I hate to sell it, but I do not have time to drive it. It needs to be with a collector that will treat it like the time capsule it is. You can reach me at 336-707-0639 The car is located in Burlington North Carolina. I am asking 5995.00 for it. This includes all documentation. jwilli43 posted a topic in What is it? original acrylic painting of an old Dodge. Price is $395.00 framed, which includes shipping inside the US. If you are in the Old Fort North Carolina area come see it in the Arrowhead Gallery and Studios, in downtown Old Fort. Add the newest technology to your beloved vintage cars! 1934 Pierce-Arrow 1240A Enclosed Drive Limo. I found this in a barn purchased seven years ago and i cannot figure out what car or truck this goes to. See pictures. The tell on this part would be the frying pan or record circular grooves on the back of the mirror. I'm willing to sell this if someone tells me what this came off of....anyone? Thx! HELP, 1950-1959 Ducati, Rare? worth? model? aldo1569 posted a topic in What is it? Hello everyone! I'm new to this forum. My name is Erica. I am currently developing a website dedicated to offering discounts on everything from vintage clothes, shoes, memorabilia and much more. Please support the site by signing up. Membership is free. The site will officially be launched in August 2011. The site is Home - I Heart Vintage Thank you for your support! Ok I have searched myself silly trying to find out information about this hubcap. I found about 20 of them in an old barn and I an clueless when it comes to this type stuff. Can anyone tell me what year and model car/truck/van/bicycle whatever they came from? Also if you know about how much they are worth that would be greatly appereciated. 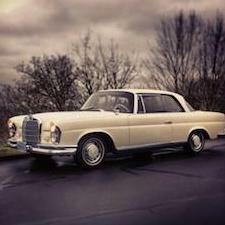 Excellent car for restoration, all original with all stainless. Engine turns over, but have not had it running. Has been stored inside for many years. Good title in my name.